For quite some time I’ve been adding a file called ui.py in some of the Python projects I was working on. Since I believe in the rule of three and I already have three different projects using it, I’ve decided to share it to the world. Feel free to take a look at the github page. 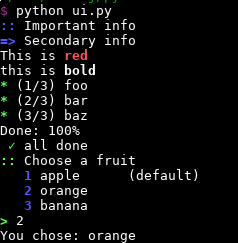 It’s a module to write colorful command line interfaces in Python. It’s a tiny wrapper on top of colorama, with a (IMHO) nicer API than crayons or lazyme. This will print the word ‘Error’ in red, the file path in bold, and the ‘not found’ normally. The API follows the behavior of the print() function: by default, tokens are separated by spaces, \n is added at the end, and you can specify your own sep and end keywords if you need to. This allows you to group your messages in a coherent way. Here the main message is ‘Making some tea’. ‘Boiling water’ is a sub-task of making the tea, and ‘Turning the kettle on’ is a sub-task of the boiling water process. There’s also a debug function, for messages you are only interested when debugging: you can control the verbosity using the CONFIG global dictionary. > "With sugar ? (Y/n)"
You can also write tests to assert that a certain message matching a regexp was emitted. Well, I hope you’ll find this module useful.